Now about 20 years into the practice of medicine, I have evolved from what they call an “early adopter” of new drugs, through a time of cautious use of new drugs, to what I am now – highly skeptical of most new medications and suspicious of Big Pharma, medical thought leaders and anyone else trying to “educate” me about a disease. I am also disappointed in my medical societies for failing to cut the ties between themselves and industry, but hopeful that we are slowly but finally starting to emerge from of an era of industry-dominated health care and into a time of patient-centered medicine. Case in point – Treatment of Bone Loss. These days, I prescribe meds much less often for bone loss. With the help of the FRAX fracture risk calculator, I’m able to determine which of my patients with osteopenia are at significant fracture risk and require treatment (very few, it turns out) and which ones can be adequately managed with lifestyle, calcium and vitamin D (most). FRAX is not an entirely perfect tool. For instance, FRAX does not account for high risk medication other than steroids. For women taking drugs such as aromatase inhibitors, therefore, I fudge the FRAX by checking off the “steroid use” box. It’s not a perfect fix, but it’s not a bad one, either. 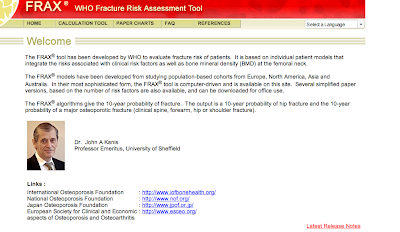 Another fracture risk assessment tool called QFracture is under investigation as an alternative that may address some of FRAX’s limitations. Despite its limitations, FRAX is a more than adequate tool in my clinical practice. I find sitting down with my patients and doing the FRAX together serves as great education for them and brings us together into the realm of joint decision making. I do the FRAX with them when they come in to have a vitamin D level checked – that’s a test I do routinely in women with low bone mass before deciding on any course of management. The FRAX only takes a few minutes to do, and my patients can take a print out of the results home along with their bone density results. By the way, in the NY Times article, Jane Brody describes FRAX as a “controversial” tool. I have not seen any controversy over its use. The National Osteoporosis Foundation appears to have embraced FRAX (actually, it was from them that I first learned about FRAX). The controversy lies in deciding if and when to treat bone loss. Like the mammogram controversy, the question is one of balancing potential harm (in this case, side effects of medication) with benefit ( lowering of fracture risk). Just read your blog. Thanks. I’m just learning about FRAX and after seeing at least 4 different ‘big shot’ NY doctors about osteoporosis diagnosis, not one mentioned FRAX until my cousin who is also a ‘big shot’ gerentologist told me about it. Why don’t they know or use it. Amazing…Anyway thanks for your post.